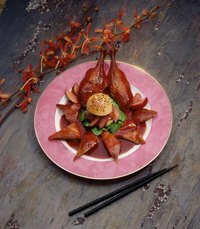 An Americanized Chinese dipping sauce traditionally paired with duck and fried rolls, duck sauce, or plum sauce as it is also known, is a sweet, sour and sometimes spicy sauce. To prevent spoilage, get the most out of the product and retain the best quality, refrigerate duck sauce after opening. Once opened, duck sauce that has been continuously stored refrigerated can last for up to two years. While color, flavor and texture may change slightly over time, the sauce is safe to use if stored properly. Unopened bottles or jars of duck sauce can safely be stored in a pantry, but their quality will begin to deteriorate over time regardless of whether they are opened or not. Always store unopened duck sauce in a cool, dark and dry location for the best quality. All commercially packaged products sold in the U.S. have a "best by" or "use by" date on the label. While this date does not reflect safety, but instead quality, it can give you a good idea to the shelf life of your duck sauce. Commercially packaged duck sauce will have a shelf life of two years if properly stored. The quality stamp begins from the time the sauce is manufactured, not when you open it. For the best quality, always use duck sauce before the date on the label. Even with proper storage, duck sauce can potentially go bad. Always use clean utensils when serving duck sauce to prevent cross contamination that can lead to spoilage. If your duck sauce develops an off-smell, flavor or color, throw it out without tasting and buy another jar. If your jar of duck sauce has any mold, throw it out. These quality and spoilage issues are uncommon with this sweet sauce, but you should always inspect condiments before serving to ensure safety. Avoid preservatives and overly sugary duck sauce by making it at home. Plums, apricots, brown sugar, rice wine vinegar, apple juice, soy sauce, ginger, mustard powder and red pepper are the key components that make up this tangy sauce. Simmer the ingredients until they are thickened, puree the sauce in a blender and use it immediately or refrigerate it until you are ready to use it. Store homemade duck sauce in an airtight container for up to three weeks. Do I Need to Refrigerate Hoisin Sauce? Does Dry Cooking Sherry Need to Be Refrigerated After Opening?